Catholic Charities West Michigan understands the value of seniors in our community and is pleased to be the sponsor of the Foster Grandparent and Senior Companion Programs of the Corporation for National & Community Service (CNCS). Senior Corps mission is to engage persons ages 55+, particularly those with limited incomes, in volunteer service to meet critical community needs; and to provide a high quality experience that will enrich the lives of the volunteers and those they serve. If you are interested in receiving more information about these programs, please contact us at 231-727-4140. 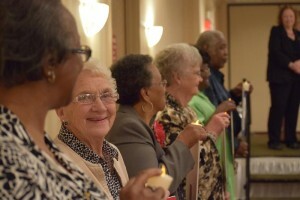 The National Senior Companion Program (SCP) of CNCS provides limited income seniors the opportunity to give back to the local community serving the elderly, shut in and other citizens with disabilities to sustain their ability to live independently, remain engaged in the community and provide respite care for caregivers. Training, supervision, recognition, and a non-taxable monthly stipend are just some of the benefits of becoming a Senior Companion. Our Senior Companions volunteer in Muskegon and Newaygo Counties. The National Foster Grandparent Program (FGP) of CNCS has been around since 1965 and provides limited income seniors the opportunity to give back to the community by serving children by assisting them to increase school readiness and academic engagement. FGP volunteers engage in and provide a positive impact in their communities. Training, supervision, recognition, and a non-taxable monthly stipend are just some of the benefits of becoming a Foster Grandparent. Our Foster Grandparents volunteer in Muskegon, Lake and Newaygo Counties.